Explore Dubrovnik on the Captivating Croatia tour! The eighth and final season of Game of Thrones is scheduled to premiere on April 14, just a few weeks away. While the Known World may cease to exist on television, fans of the show can live out their fantasies in real time by visiting the various global filming locations. Learn more about Captivating Croatia: Game of Thrones Tour, and discover how to spend the day in Dubrovnik (King’s Landing) with AESU! Fort Lovrijenic overshadows the sea and land entrances to Dubrovnik. The fortress and theater is most famous for the importance it played in resisting the Venetian rule in the early 11th century, but Game of Thrones fans might recognize it for another reason. Fort Lovrijenac doubles as the Red Keep, the Stairs to the Great Sept of Baelor, Minčeta Tower, and Cersei’s infamous Walk of Shame. GOT fans can spend hours exploring Fort Lovrijenac and recreating their favorite scenes from the show! Just off of Pile Bay, the sparkling waters of the Adriatic Sea are filled with caves, islands, and peaceful beaches. It’s the very location that Sansa Stark and Shae watched the ships before Littlefinger shared his escape plans. It’s where the Lannisters bid farewell to Princess Myrcella Baratheon. Spend the afternoon recreating these moments on Pile Bay (Blackwater Bay), then take to the sea for a kayaking adventure! Old Town Dubrovnik is an enchanting corner of the Croatian city. A walk through the intricate marble streets can make anyone feel like they’ve been transported into King’s Landing. One of the most dazzling aspects of Old Town Dubrovnik is the Rector’s Palace, which you may recognize from season two episode six when Daenerys asks the Spice King about his fleet of ships. The elaborate stairwells and high arches look as if they were carved from one large stone. Rest your legs here, and enjoy the cool shade from the large, marble pillars. 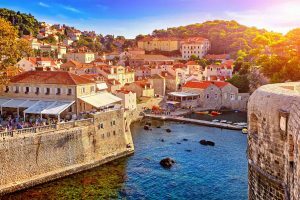 Experience an exhilarating, eight-day Game of Thrones adventure on Captivating Croatia: Game of Thrones Tour! Check out the day-by-day itinerary, and give us a call for more information! This entry was posted on Wednesday, March 20th, 2019	at 9:38 am	. You can follow any responses to this entry through the RSS 2.0	feed. You can leave a response, or trackback from your own site.